View from the edge of Byington’s WInery. At Christmas, my husband bought us passports from the Santa Cruz Mountain Wine Growers Association (SCMWGA). 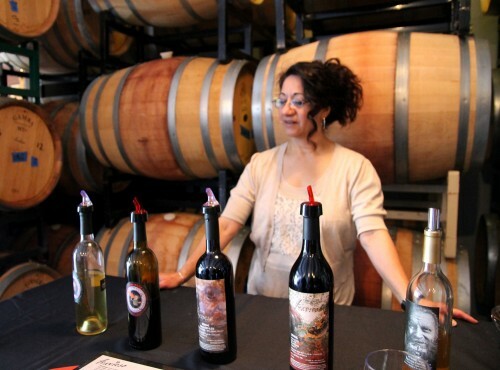 These passports, filled with over 50 participating wineries, entitle the bearers to one free tasting at each spot during normal operating hours or the SCMWGA special Passport Days, which happen four times a year and are the best opportunity to catch a tasting of the wineries not open to the public. 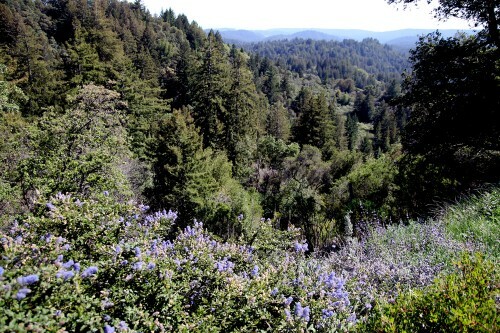 Our first time out, in March, we made our way north up Soquel-San Jose Road. 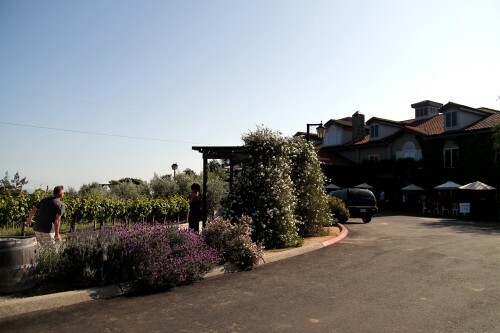 This time, we were able to get out on Passport Day and thus chose a route of wineries only offering tastings that day that followed Bear Creek Road on the other side of Highway 17. 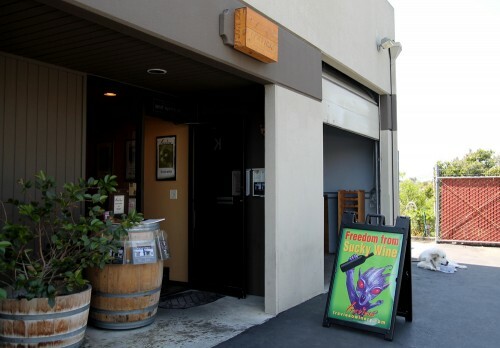 First stop, however, was actually an urban one on the way, Travieso Winery (165 Cristich Lane, Campbell), largely chosen because we needed to gas up and it was nearby the exit. Hey, opportunity knocks, y’all. Notable for that amazing alien placard, Travieso also had a party going on with mostly a crowd of regular visitors about. Our wine taster was lovely, as was being surrounded by their many barrels of wine. It’s a welcoming spot and easily accessed, though you forgo the gorgeous views that the mountains offer, of course. I didn’t find any wines to my palate there, so we trudged on. Who am I kidding? We’d trudge on regardless. Stop #2 was Silvertip Vineyards (16644 Zayante Road, Los Gatos), whose tasting was held in a meadow clearing under a tent. The nearby estate house and vines were gorgeous. Click on me twice for the full view! And the wine tasters, brothers in the Nelson family that owns the estate, were at the helm. All of their wines are produced with grapes grown on the property, and they can point out to you which are which from a distance. Their wines surprised me, mainly because I enjoyed their 2010 Petit Pinot Noir the most of the bunch (unintended pun, I swear). Normally, I don’t like petit offerings, but this one pleased me—I’ll review it at a later date. We headed next to Byington (21850 Bear Creek Road, Los Gatos), which might seem odd being as it’s open regular hours for tastings. But on Passport Days, the Byington estate hosts a few passport members you can’t sample otherwise. 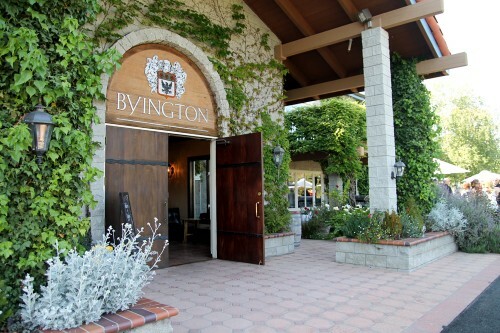 Byington is one of those wineries that exactly fit that image of a grandiose chateau we all have before we actually visit many vineyards. You know, a place you could spend all day sipping wine and playing bocce if you wanted. Walking up to the house past the bocce court. Entrance to the tasting room. Their 2009 Pinot Noir Block 4 wine, all made from grapes in the same block of the vineyard, was quite good, but I haven’t convinced myself that spending upwards of $30 on wine is worth it yet—I’m not a collector, folks, just an everyday drinker. I did enjoy the visiting wineries just a little bit more, making off with Downhill Cellars 2007 Barbera and 2010 Torrontes and Muccigrosso’s 2007 Lyn Zin. Reviews forthcoming, of course. What I liked most about Byington was getting the chance to talk with their new owner, Benny Madsen. 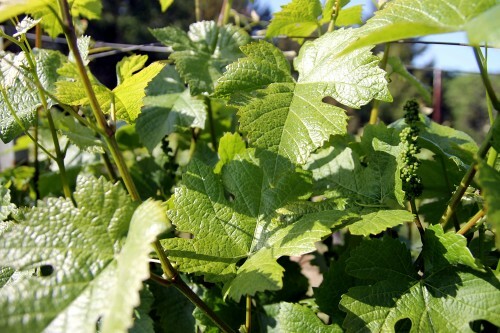 The Byington family sold the winery and property just this last year, after having started the label in 1987 and having purchased the land 30 years previously. Mr. Madsen is very approachable, and he has great plans for the property—he’s already added a hiking trail! Upcoming is their first dinner out on their large patio in front of the property’s wine caves, a paella feast! Good place for a party, I’d say. Click me twice for the full view! –and not one but two of Byington’s employees insisted I take pictures of the baby grapes on the vine. After having been to a Passport Day and spending one just out and about on our own, I can confirm that these wine passports were a great purchase! 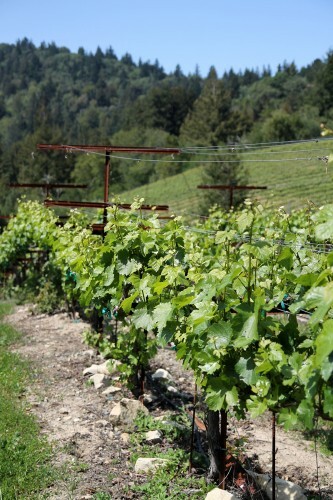 I love the excuse to explore the Santa Cruz mountains, and I’ve been impressed with how sincerely nice the winery owners have been and how we don’t have to wade through crowds of people, even on special event days. You can bet we’ll be back at least one more time this year. If you’re interested in visiting Santa Cruz, here’s a great resource from All the Rooms on all types of rooms for rent and additional info on visiting the region.